As we shake off our hangovers, and turn our attention to a new year in the comics industry, there is still time to take stock of lessons learned in 2006. For the French comics industry, the January 1 publication of the ACBD's status report provides all the necessary data for looking back on a year whose incredible highs made a number of cartoonists anxious about a possibly looming crash. The ACBD's 21-page report, The Year of Maturation, was, as always, written by Gilles Ratier (and is available as a PDF here). This is an amazingly exhaustive document, an essential report for comprehending the economics of the industry, and if you read French I can't recommend it highly enough. All of the data in this article was lifted from Ratier, who deserves all kinds of praise for what must be exhausting work. In 2006 there were 4130 comic books released in France (a staggering 80 per week). Of these, 3195 were new works published for the first time (a figure that is up almost 15% from last year). To give some perspective, in 1995 there were 485 comic books published in the same market. That represents a 900% growth in the number of titles published in France in a decade. Is there any wonder that some people are worrying about stability issues? Certainly, much of this expansion is due to the rise of manga, but far from all. There were 1799 translated comics released in France last year, of which 1418 were Asian (manga, manwha, manhua...). Two hundred thirty-nine were American (predominantly superheroes, but you can find everything from Fun Home to Matt Madden's 99 Ways already translated into French), with Spanish, Italian, German and other languages bringing up the rear. What is clear is that the French market is tremendously open at the moment, with product flowing in from all over the world. Of the 3195 new books, 1418 were manga, 1045 were published by the largest French comics publishers (albums, in other words), 493 were from the independent press, and 239 were translations of American comics. My own eyes tell me that all of this leads to a certain chaos in the comics shops. With 80 new books released each week it is almost impossible to keep up with everything that comes out. I traveled to France three times in 2006, and lived in the country for almost two months. Still, I only learned today that Marc-Antoine Mathieu had a new book published from Futuropolis (another, like the recently translated De Crecy book, Glacial Period, that was done in conjunction with The Louvre). And I'm someone who makes a genuine effort to stay abreast of what's coming out! My experience in Paris in October was simply that even at the best shops it is difficult for the casual buyer to find works that don't have tremendous marketing muscle behind them. Of course, this is not good news for the smallest presses, of which there are a rapidly growing number. While 225 publishers released comics in France last year, a mere 17 of them account for more than 70% of the total market. That left the remaining portion to more than 200 companies. One of the more contentious comments made by Ratier, at least as far as message board discussion goes, is the suggestion that publishers need to release eight books per month to be "visible" in the bookstores. This number excludes even publishers so well established as Humanoides Associes (66 books this year -- 5.5 per month). I don't know what criterion Ratier is using for visibility, but I also don't necessarily want to fault his logic. The number might be a bit high, but I can't shake my own sense that the vast majority of comics are simply lost on the sea of product. Truly, it is an era where the best-seller logics have run amok. Indeed, Ratier's numbers seem to back this up. Eighty-five series this year had sales that topped 50,000 copies, a number that is up from 77 in 2005 and 69 in 2004. The leader this year was, unsurprisingly, Titeuf (Zep) whose 11th volume sold a staggering 1.8 million copies in France. Million. Other mega-sellers were Lucky Luke (Achde and Gerra) at 650,000, Lanfeust des etoiles (Tarquin and Arleston) at 300,000, Cedric (Laudec and Cauvin) at 288,900, Enki Bilal's final book in the Sommeil du monstre series at 280,000 and the 29th volume in the Thorgal series (Rosinski and Van Hamme) at 280,000. All of these books are, of course, the new editions of long-running popular series that have been consistent best-sellers for years (and generation in a few cases). The best-selling new series is Kaamelott (Dupre and Astier) from Casterman (an adaptation of the M6 TV series about King Arthur), which sold 190,000 copies and Magasin General (Roisel and Tripp) (which is set in a rural Quebecois general store in the 1940s!) at 120,000. Manga also continued to sell well, though not at the levels of the biggest French successes. The best-selling manga in France continues to be Naruto, whose six volumes this year averaged 125,000 copies each, and which was the only manga to cross the 100,000 threshold. The next biggest titles include Samurai Deeper Kyo, Fullmetal Alchemist, Fruits Basket, Gunnm Last Order, and Shaman King, all of which sell between 70,000 and 80,000 copies. About 20 manga titles cross the 20,000 copy barrier in France, with the bulk of the remaining work trailing. While, with the exception of Bilal, these are the kinds of books that rarely get much attention on this side of the Atlantic (and certainly not in my high-browed column! ), a few cartoonists you might recognize did well for themselves last year. Jacques Tardi, who is inexplicably unmarketable in North America, sold 130,000 copies of Le Secret de l'etrangleur; Manu Larcenet sold 100,000 copies of the third book in the Ordinary Combat series, as did Joann Sfar with the fifth Rabbi's Cat book. Emmanuel Guibert sold 70,000 copies of the magnificent (and recently reviewed) Le Photographe 3 (I renew my call to have someone translate this book! 70,000 copies!). 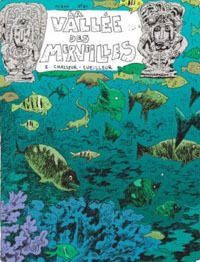 And Sfar, again, sold 45,000 copies of La Vallee des merveilles, which I reviewed and found slightly wanting. What is notable about these successes, however, is how well they were tied into the major marketing system. This summer, Sfar's Vallee was prominently featured in FNACs and Virgin Megastores wherever I went in France. Le Photographe received a similar promotional push. These books were easy to find at the major retailers, including Leclerc megastores (think Wal-Mart, but French). The same can not be said fro about 3,000 of the other new releases from this year. Moreover, the big retailers are becoming increasingly selective about providing shelf space only for the likeliest big sellers, something that will hurt the smallest publishers in coming months and years. Ratier points out that the entire logic of the industry is changing towards new releases. 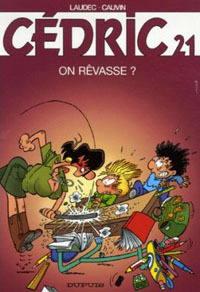 Whereas the French industry has always relied heavily on an ongoing back catalogue that generated revenue (in stark contrast to the traditions of the US industry, who for so long allowed their older titles to languish unavailable to readers except as highly collectible back issues), that is beginning to change, with new releases accounting for a greater percentage of total sales. This shift could really harm the industry in the long term, particularly smaller publishers whose books are not immediate best-sellers, but which build steam (and readership) over years. Now, publishers are scrambling to make old books seem new again with new covers, new editions, collected versions, deluxe editions, and so on. That said, one of the highlights of the year was the fact that 133 books that had been out-of-print for more than 20 years were brought back into print. In the end, Ratier argues that 2006 was the year that French comics reached maturity. That might be true. But it also could be the calm before the coming collapse. Everything I hear in the weeks building up to Angouleme 2007 is that a crisis is coming and that it may be at the festival that we start to see the cracks. I guess we'll see. What is clear to me is that the French market is bigger (not necessarily better) than ever, and that there are a lot of winners. The question becomes: What becomes of the losers? While this article talks about sales, as Xavier Guilbert has pointed out in a letter to this site, the ACBD report is actually concerned with initial print runs rather than sales to readers. While many of these titles will sell out this initial print run (or have already), readers should be cautioned that these numbers do not necessarily reflect final sales. We will try to update with actual sales numbers later in January.